One of DC Comic's most iconic characters is getting a new look and a new back story. Wonder Woman hasn't changed all that much since her debut in 1941, so in an effort to revitalize the character - and to attract new readers - Babylon 5 creator J. Michael Straczynski is giving the character a more grounded backstory and modern look. Wonder Woman's new origin, which starts with issue #600, is the result of interference in her timeline by unknown parties. Instead of being raised as a princess on the magical island of Themyiscara, Diana was raised in New York City by survivors of an attack that ravaged the Amazonian homeland. Straczynski hopes that these changes will make the title more accessible and help reverse the falling sales figure. "Wonder Woman is a terrific character, strong and bright and compelling, and she should be selling in the top twenty on a regular basis. But for the last few years, despite some really good storytelling, she's selling in the low 70s," Straczynski said. "This is one of the surest signs that the stories, as good as they are, have become too insular ... This isn't a reflection on the character, the writers or the fans ... It's a perception issue, and as a friend of mine once pointed out, sometimes the only way to see clearly through a stained glass window is to punch a hole in it," he added. 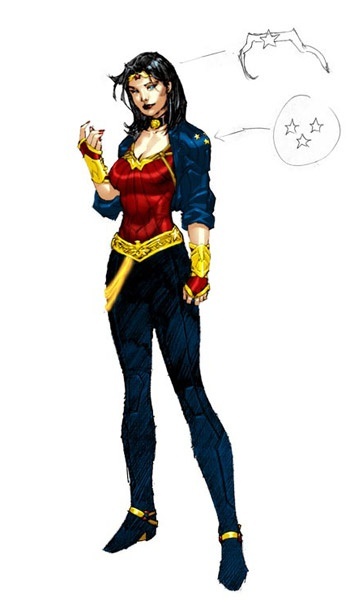 Straczynski said that unlike other characters in the DC canon, Wonder Woman has undergone very few changes in her 69 year publication history: "It's long overdue. Her look, her dynamic and the sorts of stories being told have ossified over the years ... The resultant question being, if you were to design Wonder Woman right now, as though she had never existed before, what would she be like? So there's the timeliness issue." The changes to Wonder Woman are so significant, Straczynski is conscious that fans may balk at them, and asked that they give it a chance: "I know it's a bit of a jump, but in the long haul, I think you'll approve. And to those who're thinking about checking the book out ... you're jumping in at the right moment, to a whole new chapter. You don't have to know enough about Greek Mythology to pass a test, and the slate is clean. Jump in and join the fun." Wonder Woman #600 goes on sale today.